Its one of those things that make you stop and do a double take. When the appraisal comes in low it’s not like you can just drop your bid, the most common outcome is that the lend just declines to lend on the property. You are back to square one and you have to go back out into the market and hunt for a home like you have already been doing. This time it gets a little more tedious because of the experiences and delays and disappointments that you endured the first time around. So what are a few of the things that you can do to save this deal? Appeal all errors and omissions by the appraiser: The first thing is to get a second opinion. The bank is the one who need to have the right numbers but they may not have employed the most knowledgeable appraiser for the particular location you are looking at. If you think that the comps that were selected to make the comparison are not in line, talk to the appraiser and if they prove to be unresponsive then you should turn up the heat by talking to the bank and see if it can be redone. 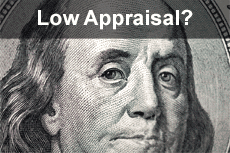 Ask your lender to provide a second appraisal opinion. This is the first step in response that you can make to a low appraisal. On the other side of the coin, look to the seller and use the appraisal as leverage to renegotiate. The seller may have just been too optimistic or had poor advice; they may be interested enough in selling to you that they’ll agreed to revise terms. There is no reason you cannot do this at the same time as getting a second opinion. Depending on how motivated your seller is, they may be receptive to making some sort of concessions on price or terms. The mortgage lending market is vast and diverse, even after the big shake up of the last few years. If you have used a mortgage broker they may be limited in how they can respond or in the selection of the appraiser. By looking for an alternative source, you put the pressure on the lender to compete for your business. It may sound daunting to challenge something so official seeming as a real estate appraisal. Unfortunately, the secret of the industry is that there are issues of training and the way that appraisers are compensated. This has caused some real structural problems within the industry. If you push back you may find the chances of getting a favorable reappraisal are higher than you might think. At the end of the day, lenders want to lend but they want to be confident that there is adequate security behind the loans they write. When your appraisal comes in low on the home you are looking to purchase, don’t hesitate to stand your ground and also to use it to your advantage.